"you can play with me, but only for as long as I and the air are in control, hence, we are really playing with you." This fundamental fragility is taken as a point of departure for making. Making encompasses everyday acts of creation such as cooking, repairing clothes, arranging a room, assembling a washing line as well as more self-conscious design and make processes such as the industrial design of a ship. This fragility, along with the courage to make (a world) (Reyes, Jaime, La condición humana y el mar, 2012), is intrinsic to our human condition as well as to the things we make. At any point in time all are vulnerable to damage, destruction, or, in more moderate language, change and modification. In making to inhabit the sea, this fragility is heightened, as is our consciousness of it. Resisting the inclination toward civilizing the interaction, through making within the context of the intensity of the sea, instead of hiding this fragility, why not make its articulation fundamental to our being within it? Originating from the French word to glue, collage refers to technique and the result of assembling different materials on a backing. Existent from shortly after the invention of paper, collage took on a role in the fragmentation of space and assembly of found objects through modern art. Here, the original cut and paste method was extended to include an assembly of different techniques of painting, drawing, relief and sculpture(+ sculpture though assembly). Through overlap, juxoposition and transparency, it proved an evocative and ambiguous method of communicating experience. So effective, that this practice has continued to the prevalent present day use of digital collage by designers to visualize proposals. With copying, pasting, layering, cropping and transparency as the lead functions. Within the media of two-dimensional representation this technique can be highly suggestive of three-dimensional space. It becomes three-dimensional through the application of time. Here it intersects with photography, film, theatre and architecture. It no longer requires a literal ‘glue’, adhesion can occur through layering: physical layering, temporal layering and a layering of memory. Through the overlay of memory and time, it is also a literary tool. In Derek Walcott’s poem, The Sea is History(Collected Poems, 1948-1984), the waters hold the memory of the Caribbean and its Biblical heritage, intersecting in literary time and space with its physical inhabitants through metaphor. This sea is a repository: A house of memory and of animals, vegetables and minerals. 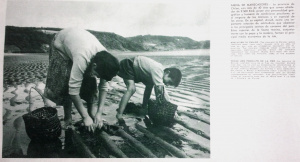 The sea is an active medium for the collage of memory, metaphor and events to take place. But like the sand, in the concept of volver no saber, the sea does not remember. "The sea kept on turning blank pages." Photography, however, is a means of fixing memories. We can see through photograms a superimposition, a layering in time and space that is fixed in the darkroom through the application of light and chemicals. This is not a fixed moment, but a series of overlaid moments, with their own inherent dynamism. What happens when we introduce resources? 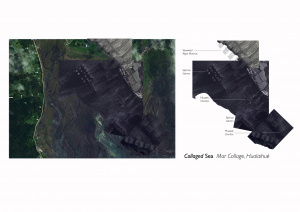 When we apply Collage to the sea? The fundamental creative intention is to apply time and resources to a collaged inhabitation of the interior seas. How can interaction with the waters be consistent (or consistently varied), multi-faceted and not singular and temporary when the waters themselves are inconsistent? The interrelated ecologies of the land and waters in this region are themselves analogous to a collage of time and resources. However, at the level of industry, practice is much more homogenized and independent. The dominance of the intensive monoculture practice of salmon production runs counter to the essential logic of the existing ecologies and to the ideas of overlap and interrelation. 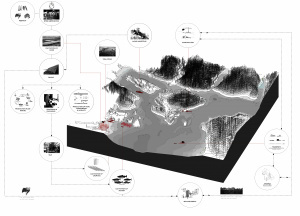 The intention is not simply to create a pluralized overlap, or a sophisticated copy-paste exercise preoccupied with composition, but a layering of inhabitation to create dynamic and sustainable interrelationships that articulates the fundamental fragility of inhabiting the waters and takes its cue from the varied ecologies that arise from the interplay of different types of waters, and from an idea of economic ecology. Systems of poly-culture(Integrated Multi Trophic Aquaculture), construction, transport and energy production have strong spatial components. Through sensitive interrelation, physical and poetic, these systems can be used to found and expand collaged inhabitation of the seas. 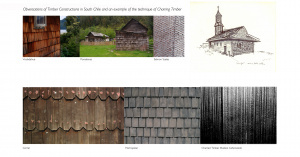 Collage in architecture is a common concept. The most well known articulation is Collage City by Colin Rowe and Fred Kottler, where the death of (reductive) modernism is proclaimed and an alternative, pluralized approach to history is proposed (Rowe, Koetter, Collage City, 1978). This generalized eclectic approach to architecture and the city is not particularly helpful in the context of the sparsely populated interior seas, where the waters hold history but do not remember. However Rowe’s focused writing on transparency (Rowe and Slutzky, Robert, Transparency: Literal and Phenomenal, Perspecta, Vol. 8. (1963), pp. 45-54) provides relevant insight into conditions of overlap. "If one sees two or more figures overlapping one another, and each of them claims for itself the common overlapped part, then one is confronted with a contradiction of spatial dimensions….The figures are endowed with transparency; that is they are able to interpenetrate without an optical destruction of each other. Transparency however implies more than an optical characteristic, it implies a broader spatial order. Transparency means a simultaneous perception of different spatial locations. Space not only recedes but fluctuates in a continuous activity. The position of the transparent figures has equivocal meaning as one sees each figure now as the closer now as the further one." "the transparent ceases to be that which is perfectly clear and becomes instead that which is clearly ambiguous,"
Ambiguity as a material and intellectual condition is critical to perception of the Interior Seas. Ambiguity through overlap, such as through the mixing of river, sea and fjord waters of different salinities. Ambiguity through constant change: such as the movement of the tides and the consequent appearance and disappearance of the intertidal zone. And ambiguity through subversion of expectations: when the waters serve as highways and house gardens, markets, playgrounds and petrol stations. Ambiguity does not exclusively coexist with transparency but is a frequent result of transparency and collage. Rowe and Slutzky make the distinction between literal and phenomenal transparency in architecture. The literal condition is applicable to a material occurrence of simultaneous perceptions of interpenetrated forms, such as when looking through glass, and the phenomenal applicable to the implication of the intersection of planes to create a perception of space and depth that may or may not exist. In this sense the physicality of the sea and its revelation of the intertidal zone can be said to be literally transparent, whereas the implications of the form and depth of the bathymetry from the formation of the topography is a phenomenal condition. However with the revelation of the tides, the discovery of the actual bathymetry has the potential to become at least a partially literal condition. The difference is between a material stratification of space and an implied stratification of space. 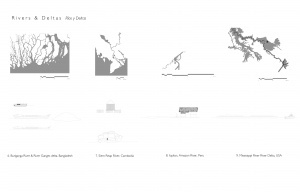 Relevant stratifications of space exist in layers and depth of use. The interior coastal edges of the Chiloe archipelago are dotted with palafitos houses, wooden ship-building yards and mussel farms. At the fjord edges, inhabitation is sparse but the waters are dotted with the nets of salmon farms that reach down to 20 metres underwater. Passing through the fjords by boat, we don’t see the salmon, but floating feed rafts and nets imply its presence. 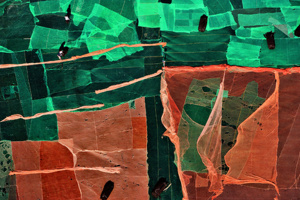 In the Rio Madeira, a similar condition occurs, but with more ambiguity due to unfamiliarity. Travelling from Manuas, Brazil to Porto Velho for four days by boat, small, pitched-roof covered barges are seen scattered along the river edges. 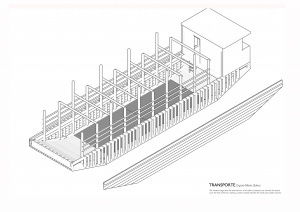 Usually timber-framed, and sometimes with a roof-covering of reeds, they have trays, plastic tubes and mechanical equipment that resembles a threshing or harvesting machine. For four days we questioned the boatmen and our fellow-passengers as to what these strange river creatures could be, with no more conclusive answer than ‘dragas’. But what is a draga? From our limited Portuguese we understood that is was some kind of dredger. But what could it be dredging? 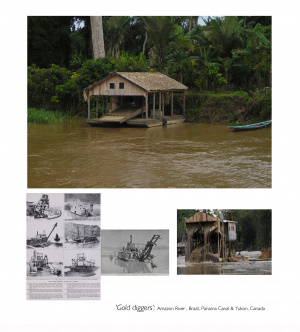 Only when a draga-worker yanked on his gold chain did it click that these creatures were actually gold-diggers, dredging and filtering the ‘wooden’ riverbed for gold dust. Attempts at industrial-scale dredging in the Rio Madeira have been attempted and failed due to the ecological imbalance created by industrial dredging of the riverbed, but the artisanal practice lives on and provides some sustenance for the riverine communities. These foreign machines unknowing initiate knowledge of what lies beneath the water and of ongoing conflicts with forces of industrialization. 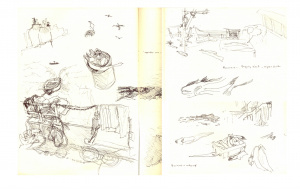 A similar tension exists between the forces of craft and industry within the interior seas. The waters of the Los Lagos region are some of the most fertile in the world, able to house an incredible variety of aquatic animals and plants. But the productivity of the water makes it a commercial commodity leading to constraints that formulate an urbanization of the seas. The tension created by these boundary conditions is both conflicted and stimulating. Questions arise: How can harvesting as a manual process expand to include cultivation and intersect with industrial practices? 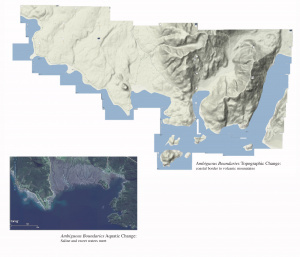 What is the spatial impact of diversifying the aquaculture industry? What happens to the intermediate space of the beach? How can the harsh edges of the fjords be inhabited? Tectonics is a description of the material qualities of space and place, embedded with meaning from its geographical connotations (plate tectonics) as well as from architectonics. It encompasses a subjective idea as to how things are conceptualized and made (artificially and naturally), as well as a pragmatic component as to how things are physically constructed. There is no definite boundary between the subjective and the pragmatic, and there intersection creates an experience of space. The dominant materials of the terrestrial part of the Los Lagos region are wood and stone. Whilst the strongest craft traditions are related to working wood and working the waters, there is an absence of stone-working traditions. 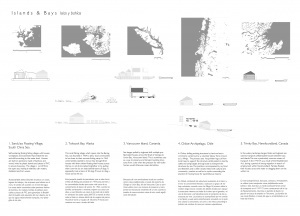 This sets up a condition in which timber is seen as a malleable material, seen especially in the distinct construction of Chilote churches, boats and palafitos houses, whereas granite is seen as a monolithic obstacle to construction and inhabitation, marking the harsh edges of the fjords and the volcanic mountains. Wood is additive, workable and transportable within the waters, whereas stone is monolithic, obstructive and static, except through unpredictable volcanic activity. The volcanic rock pumice, however, may find a use as a hydroponic medium, it’s porosity making it ideal vessel for holding the nutrient solution for the plants. Within saline water, wood is threatened by marine worms. The demise of Embarcacion Amereida bears witness to this. As such, through interaction, the most readily available and malleable materials of the area, wood and water, are set in opposition to each other. Through a Japanese technique of charring timber it may be possible to modulate the interaction of wood and saline water. The ancient technique not only provides a fireproof layer, but also protection from marine worms. Thus, could provide a solution for the exposed, non-structural elements of timber constructions, as well as providing a strong tectonic that limits an experience of material transparency in favour of the phenomenal. 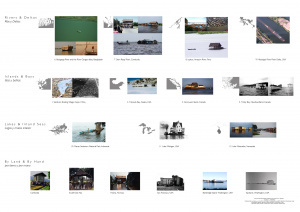 A tidal water body heightens awareness of temporality, movement and dynamics. Distance is understood in time. Time is materialized through the tides. The weather is ever-waiting to remind you of its potency. 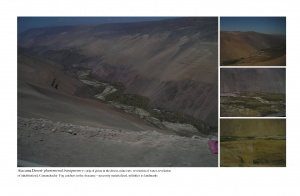 Along with the volatile geological structure, there is a sense of a constant state of dynamism. Nothing is fixed. Here lies the recurrent state of flux. 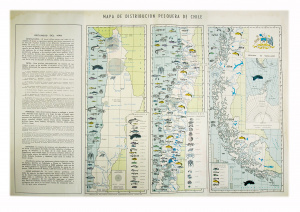 This is embodied in the Minga practice of moving houses within the Chiloe Archipelago. Instead of simply moving from one building to another, a practice contemporary urban dwellers are familiar with, structures are physically uprooted and carried by land and water to their new pasture, as if another piece of rather large furniture. 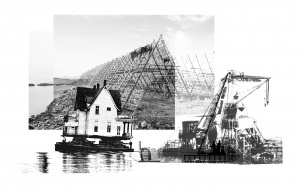 The move is often initiated by superstitious belief in the bad omens of the previous location, and, like the gold diggers and the floating petrol stations, creates an phenomenon that subverts expectations: a pitched-roof house floating on water. This phenomenon is critical instigator to the formation of the project and its dynamic basis. It highlights the quality of subversion that is characteristic of putting two very familiar things together to create something unfamiliar; this quality is critical to the interpretation of collage sea. 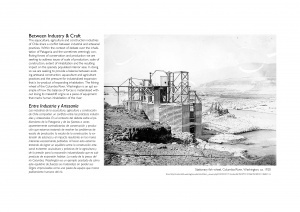 In the context of infrastructure for water-based construction and cultivation, temporality is intrinsic design element. 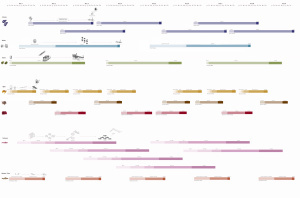 Time manifests itself as a measure of the growth of marine and hydroponic products(see aquaculture schedule), of drying and processing, of travel times of materials, and of the building of new structures. Patterns of weather, and tides acutely affect travel and transport, and have their route as expressions of time. Temporality is not an element to be regulated, but to be observed. Something that moulds us and moulds the things we make as opposed to being malleable by us. Dynamics is interpreted as a means of facilitating and housing change. Hence including, but not limited to the movement of elements within space and time. 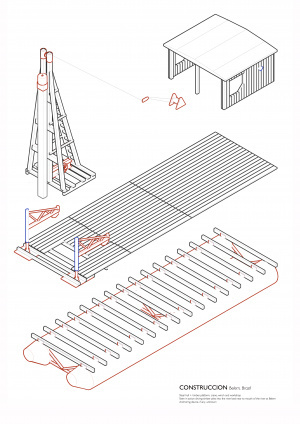 This is not exclusive to moving parts, but inclusive of static elements that house change, such as a algae drying tower, where the plants dehydrate over time or a boatyard, where boats come and go. Like conditions of transparency, dynamism may be literal or phenomenal. 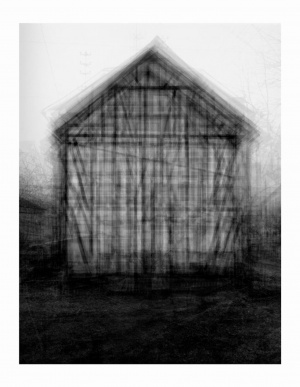 Phenomenal dynamism may refer to representation of movement, such as the implied dynamism of a two-dimensional image, such as the layered images of Idris Khan, where found images are superimposed, creating a sense of moving objects from still images (http://www.saatchigallery.com/artists/artpages/idris_khan_becherhouse.htm). This images are highly suggestive of both the movement of its subjects, as well as the physical process of overlay, giving a sense of the dynamism with which they are made as well as the implied dynamism of the resulting objects. This gives rise to the condition of housing process in space, whether within the space of the page, or architectonic space. 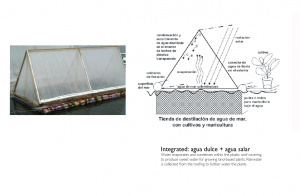 By roofing a small portion of saline water to distill it to leave sweet water and by using the same roof to capture rainwater, a floating roof becomes a freshwater-collecting house for hydroponic growth. By setting an oyster mesa de cultivo in the intertidal zone, it becomes a fixed measure of the ever-changing movement of the tides, a static element that reveals the movement of a dynamic one. By creating the appropriate conditions in terms of light, air and temperature a seedling centre houses the germination of seeds, the first step in the process of cultivation of algae. A revelation occurs by dedicating space to these processes and/or by establishing a measure of them. As such, making, and the purpose of the project, is not so much the design of something new as it is the revelation of something(s) inherent. In the language of the school, the revelation or discovery, is el regalo de la obra. 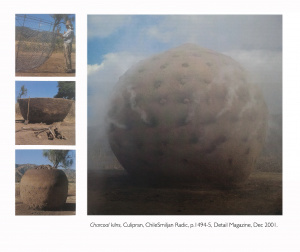 The same can be said of Smiljan Radic’s Charcoal kilns in Culipran (p.1494-5, Detail Magazine, December, 2001). Here, the above-ground spherical kilns are in contrast to the traditional charcoal kiln, which consist of a hole in the ground (approximately 120cm deep and 300cm diameter) covered by a mound of clay. Like the oro diggers, process is housed in unusual architectural forms that instigate a change in the form of what is contained within and stimulate curiosity as to their functioning. What are inherent are the properties of the materials and the requirements of the process, and the forms themselves initiate a revelation of these. The concept of Maritorio as analogous to territory suggests a mari ’culture’ alternative to land-based culture. This concept of mariculture or the culture of the sea is more than the literal interpretation of producing resources. It encompasses an idea of what it means to inhabit the sea: to live from its resources and with the inherent fragility that results from its intensity. 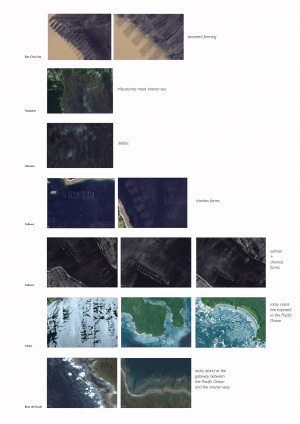 This we see in the vast scale of inhabitation that exists within the South China Sea , as well as the Japanese coast, which are perhaps the most extensive examples of the idea of Collage Sea. 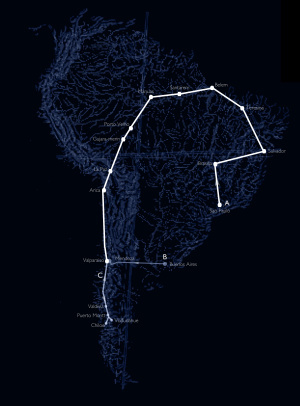 Floating villages and sea farms spread for kilometers, sometimes including houses, post offices and police stations and interconnected by floating pasarellas or at times only accessible by boat. 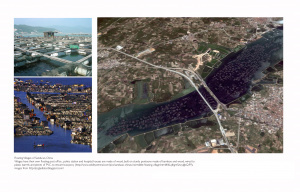 The water sprawl is arguably similar to that of contemporary Chinese cities, but even less regulated, suggesting a chaotic ‘urbanisation’ of the sea. In the interior Seas of Region X, the expression of mari’culture’ is more subtle. 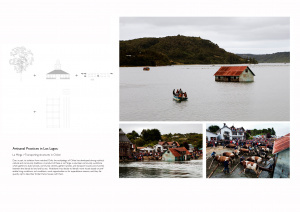 From buying fresh fish by meeting a fishing boat on the waters (see sketches), to artisenal traditions of mussel and algae collection from the shores of Chiloe or building wooden boats by hand, day-to-day practice takes on very precise form with relation to the waters. It is the nature of this practice that the project seeks to understand, expand and house. Bateson, Gregory, Steps to an Ecology of Mind (New York : Ballantine Books, 1972). Benjamin, Walter and Tiedemann, Rolf, The arcades project (Cambridge, Mass. : Belknap Press, 1999). Giovanna Borasi; Kozy Amemiya; Erika Beyer; Centre canadien d'architecture. ; Actar. 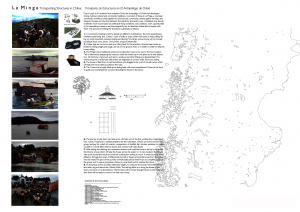 ; et al, Journeys : how travelling fruit, ideas and buildings rearrange our environment (Montréal : Canadian Centre for Architecture 2011). Boris Ivelic k, Embarcación Amereida y la epica de fundar el mar patagonico, Ediciones Universitarias de (Valparaiso, 2005). C.S Lewis, The Screwtape letters (New York : Macmillan Co., 1943). Kepes, Gyorgy Language of Vision (Chicago: Paul Theobald, 1944). 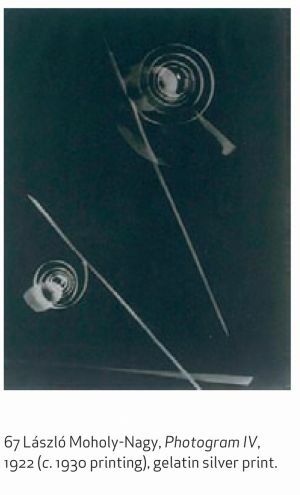 Moholy-Nagy,Laszlo, Vision in Motion (Chicago 1947). 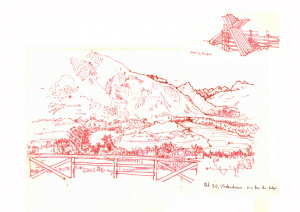 Pendleton-Julian, Ann M, The Road that is not a Road and the Open City, Ritoque, Chile, (MIT, Cambridge, USA, 1996). 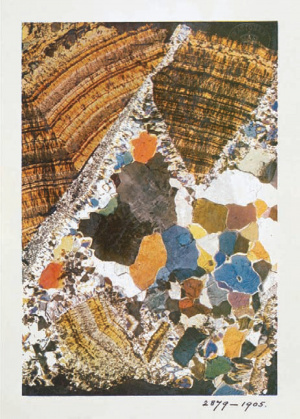 Rowe, Colin and Koetter, Fred, Collage City (Cambridge: MIT Press, 1978). Pallasmaa, Juhani, The eyes of the skin : architecture and the senses (Chichester : Wiley-Academy ; Hoboken, NJ : John Wiley & Sons, 2005). Walcott, Derek, The Sea is History, from Collected Poems, 1948-1984 (London: Faber, 1984). Reyes, Jaime, La condición humana y el mar (Valpariaso, Chile 2012). Rowe, Colin, Slutzky, Robert, Transparency: Literal and Phenomenal (Perspecta, Vol. 8. (1963), pp. 45-54). 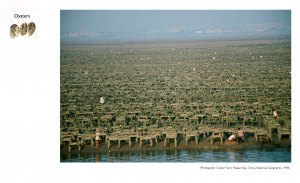 Oyster Farm, Xiamen, China, 1997, South China Sea: Crossroads of Asia, December 1998, National Geographic magazine (http://photography.nationalgeographic.com/photography/enlarge/oyster-farm_pod_image.html). Charcoal kilns, Smiljan Radic, p.1494-5, Detail Magazine, Review of Architecture: Experimental Building, December, 2001. Escuela de Arquitectura , Universidad Católica de Valparaíso, Maritorios de los Archipiélagos de la Patagonia Occidental (Escuela de Arquitectura ucv :Valparaíso,1971). 1:1 Architects Build Small Spaces, Exhibition 2010, Victoria & Albert Museum, London: http://www.vam.ac.uk/b/blog/11-architects-build-small-spaces. Se editó esta página por última vez el 25 jul 2013 a las 17:17.